So, whoever is reading this, you all remember what happened in sixth grade, right? When Origami Yoda helped me ask out Sara during Fun Night? Well, I didn’t exactly “ask” her. A song came on and I just happened to be standing next to Sara, so we just decided to dance. 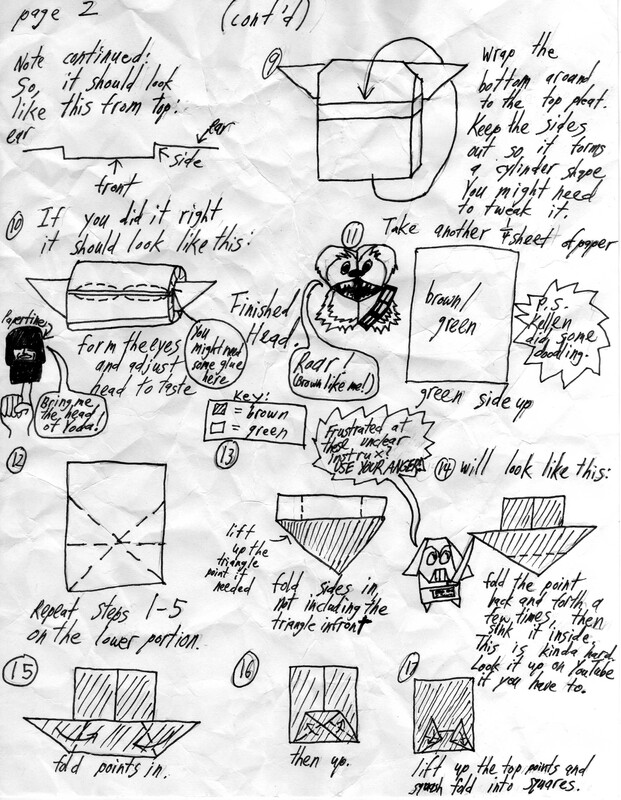 Harvey, our former friend, tried to prove that Origami Yoda was fake by making his own Yoda, which I admit was pretty good, but gave terrible advice. He and our weird friend, Dwight, who wields Yoda, had a fight with Harvey on whether Sara liked me or not. They both agreed that if I asked Sara to dance and she rejected me, then Dwight would have to throw out Origami Yoda. If Sara danced with me, Harvey would have to get rid of his Yoda (I secretly nicknamed it “Darth Yoda”). And ever since we stopped FunTime, me and Sara would hold hands in the hallway, and she wanted to kiss me on the cheek, but the Principal would always stop us from our so-called “Public Display of Affection”. When her lips were about 1 centimeter away from my cheek, the Principal pulled me away from Sara and gave me detention for a day. After school, I walked into Room 37, where detention was held. Of course, Zach Martin was there, and on occasions he would give me dirty looks. Harvey was there, too. I wasn’t surprised. But what was weird was that I saw that he had something in his hand that looked green and brown. I was curious, but I couldn’t ask him what it was because he was in the corner of the room, and I was in the front. I couldn’t walk up to him because then I would get into more trouble than I already was. At the end of detention, I finally asked him. He responded with a big, “MIND YOUR OWN BUSINESS!” And then he left. Little did I know that little green thing would cause more trouble than ever before! Kellen’s Comment: Jacob Minch is out for this one, because he’s helping out at his brother’s school, trying to get a good appeal from the Student Council. I think he’s making a case file, too….. So, uhh, I’m gonna use the recording thingy again, so, uhh, you can write all this down, Tommy, and, uhh, you can edit out all the “uhhs”. So, I was at lunch on the snack line to get a popsicle, when I saw that Harvey was on, too. I could see that he had his money in one hand, and a green origami character on his finger on the other hand. I didn’t get a good look at his origami because I forgot my glasses at home, so I secretly cut in line to get a better look at it. I was surprised when I found out it was Harvey’s old Yoda! When Harvey realized I was looking at it, he yelled, “STOP STALKING ME!” and pushed me out of line. I couldn’t get back to where I was because Quavando kept saying, “No cutting!” I ran as fast as I can to tell Origami Yoda. I found Dwight sitting under the table when I told Yoda everything. He responded, “A duel of Yoda’s there will be. Only one will survive.” Then Dwight crawled back under the table. Tommy’s Comment: Oh my Jabba! Harvey’s Yoda returned?!? I swear to Jango Fett that I saw Harvey throw it in the garbage before he sat down on the stage during Fun Night! He must have took it out before getting picked up by his step-dad. But wait…didn’t Harvey just have an evil puppet after Darth Paper? It was…um… Brain fart. Forget it. Dwight then started freaking out until I told him I would go straight to your house and tell you. The rest you already know. I told Kellen everything that happened with Sara, Dwight, and Harvey. He said I can talk to his older brother, Tyler. He usually is the troublemaker of McQuarrie Middle School, and kind of has the skater-boy reputation. Even Zach Martin is afraid of him! But he is very protective around Kellen for some strange reason. He can pick locks, which is handy. And he can do all sorts of athletic stuff, like back-flips and jumping. Anyways, I went to Tyler’s room, and saw he was trying to practice copying his mom’s handwriting. He said, “What do you want, Squirt?” He always calls me, “Squirt”, for some reason. Anyways, I told him our problem and he said he would help us for $20. I reached into my pocket and gave him my $20 I was going to use for lunch tomorrow, but this is more important. He said he had a plan. So, for some strange reason Kellen told me I needed to write a case for his friend’s stooky case file, as well as distract PikPok Pete (aka Harvey). I went up to Harvey and asked him if he wanted to hear me list all the words IiPad recently made up, because “Stooky” was too mainstream for me. While I bored him, Kellen’s brother, Tyler (he really scares me) snuck up to Harvey’s locker and stole some piece of origami and replaced him with a note. 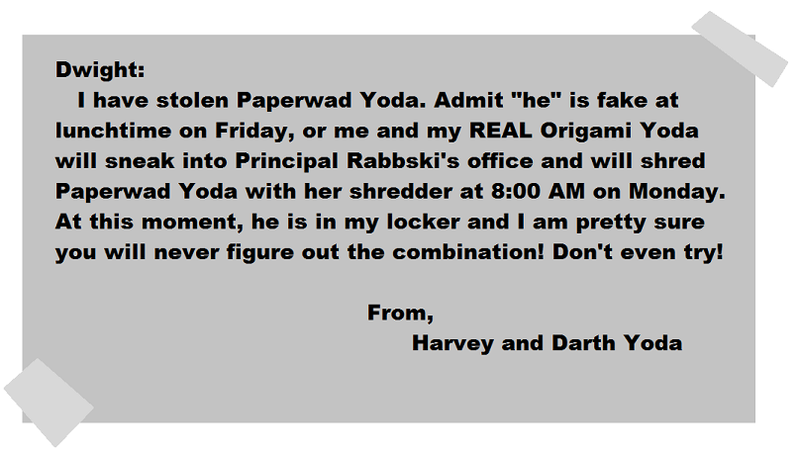 When Harvey had enough of it, he threatened me with some Origami Yoda and reached into his locker to find a note. When he read it, he screamed like a girl and ran off and dropped the note. Harvey, this message is for you. I have your Darth Yoda, and you have Dwight’s Yoda. 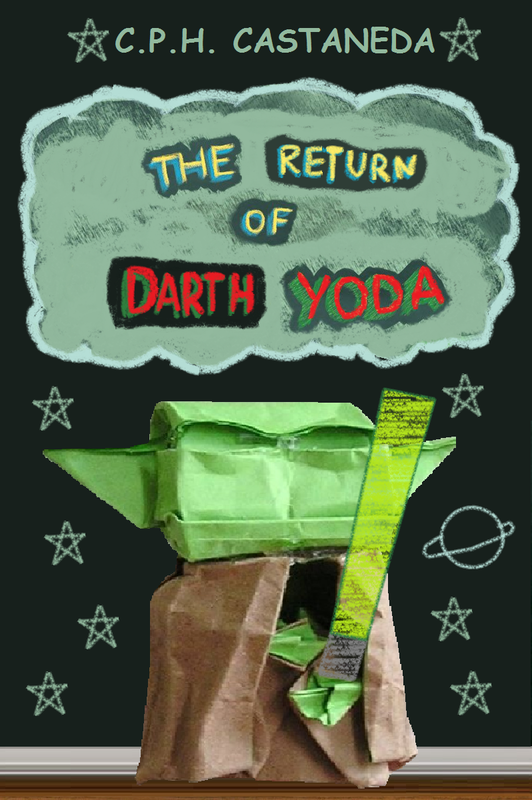 If you don’t want me to give you a swirlie next week, you’ll return Origami Yoda to Dwight in the library tomorrow. And we’ll return Darth Yoda. And as I said, if you don’t…it’s toilet-time, Cunningham. Tommy’s Comment: I was actually in Math Class in the other side of the school and I could hear Harvey scream! At first, I thought it was Quavando’s sister or something before I read this chapter. It was just before first period, and we were in the library. I was sitting with Kellen and Dwight, when Harvey walked over. He looked pretty angry. “What are you talking about?” Kellen said. “We didn’t steal…..” His voice trailed off. He pointed his finger at something right behind us. Someone had placed a sticky note on a nearby library book. Harvey snatched it, and showed it to all of us. Origami or not, you must realize…You are doomed. The Revenge of General Whiteout! General Creasious is Episode 11! Oh… I also got a name in mind. General Whiteout! Please write more or write another story please!!!! How do you fold the darth Yoda? Dr. Vhanoss, it’s a good thing you were just on this site this once. And yes I purposely spelled your name wrong to annoy you, Vhanoss. 😂 Vhanoss rhymes with Thanos. I’m going to be working on Foldo here. “Do you here a sound?” said Sara, who was hiding outside the public library behind a wall with her boyfriend, Jacob. “Nah, not really,” Jacob said. “Quick, let’s run from Maddox and his posse!” Sara said quickly, tightly grabbing Jacob’s hand and running away. Maddox then said Sara and Jacob running to the street. “Ah…,” said Maddox slowly. 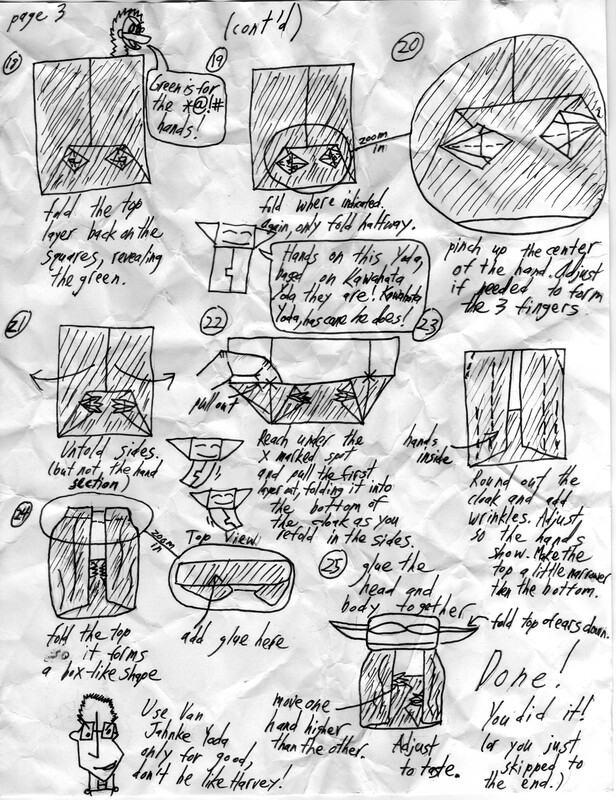 “I see them.” He pulled out Origami Moloch. Sara and Jacob ran down the street faster while Maddox and Moloch and Rebolt chased them. Maddox ripped Origami Moloch’s head off. Sara and Jacob ran out of the bush quickly and started running again. Then Maddox caught up to them and shoved them into a corner. As Maddox was about to punch Jacob in the face, Sara stood up to Maddox, took Origami Moloch, crumpled it, and then ripped it into a million pieces. Maddox got angry after that. “Come back here!” he said. He shoved Sara into another corner. Then Rebolt and his posse appeared in back of Maddox as they started walking towards Sara. Let me explain how Sara and Jacob got into this situation. They were having a normal date at the cafe near the library when they went in with…guess what…lottery tickets. The night before, Sara had said that she predicted what the winning numbers might be. They won. Yes, Sara Bolt won the lottery. And at that time, Jacob was being passed around, foster family to foster family. By that point he had enough and said he would use some of the money to get a permanent family. Unluckily, Maddox and his group heard them talking and wanted them to hand over the money. Then Sara and Jacob started hiding behind a bunch of walls, before going off into the street, with Maddox chasing them. Now, back to the story, eh? Jacob grabbed Sara and started running with her again. “Are we gonna be running forever? !” Sara said. Jacob and Sara ran faster and faster, but nothing would work. Then, they saw a bunch of bikes in the entrances of an alleyway. Before they could get one, Maddox and his friends appeared and grabbed the bikes for themselves. “Oh no,” Jacob nervously said. Maddox said, “Everyday I go to the library to bully nerds for fun with my friends. One two threes, they’re the keys, basic bullying, very easy. To my world of fun (bullying) where no one leaves till punched and kicked at, every street is full of kids, to run away until they’re bullied. Rebolt grabbed Sara’s backpack, which was full of the lottery money. But Sara snatched it back and hopped onto the bike, accidentally pushing Rebolt off and onto the ground. “Running across the streets, hiding behind walls so they don’t get beaten up. Follow every single rule, or we’ll be even more angrier. For I am listening and watching everyone’s progression, and all mistakes have consequences, so get bullied today, no questions. Maddox saw Jacob hop onto Sara’s bike. Maddox jumped off his bike, and grabbed Sara and Jacob by the necks. Jacob punched Maddox in the face and left with Sara. The unconscious Maddox was on the floor. And guess where Sara and Jacob had arrived? That’s right. The adoption port. And that’s an exclusive sneak peek of the first two chapters of Foldo, which is currently on hold. I probably will do only one more sneak peek before someone releases Foldo. Okay. This draft of Foldo has been scrapped. Goodbye.